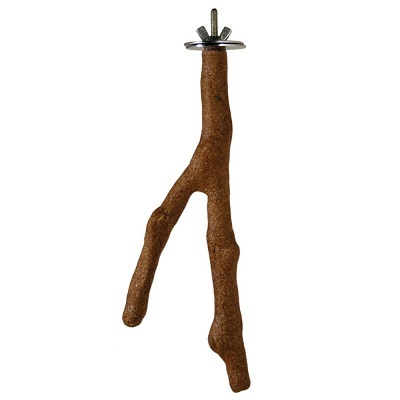 Prevue Pet cosmic crunch perches are made from rubber tree wood with a 100 percent natural pulverized seashell coating, however, as pointed out by a customer there is dye added. The unique shape of the perches provides excellent foot exercise and the hard coating keeps beaks and nails trimmed. It can be easily washed off with water. Cosmic Crunch perches are ideal for parakeets, cockatiels, lovebirds and other similar-sized birds.